The horizontal recirculating airflow and exceptional temperature uniformity of the LAC benchtop oven make it a good fit for a variety of applications in the healthcare market. The LAC is commonly used for curing plastic and non-volatile composite coatings and polymers on medical devices, warming materials to soften and fit to a prosthetic mold, sterilizing glassware and basic drying. The Despatch LBB Forced convection benchtop oven features a combination of horizontal and vertical airflow that offers excellent temperature uniformity at a moderate price. The LBB2-27 is available with pass-through doors for a seamless process flow through the work cell. Optical labs recommend it for curing scratch resistance coatings. The LCC/LCD clean process ovens are the perfect solution for many companies in the healthcare market. These ovens offer 100% HEPA filtered air for processes where minimal contamination is essential. Common applications include: sterilization and depyrogenation of metal used in surgical rods, medical components, implantable devices and orthopedics; dry heat sterilization; adhesive coating and curing; and annealing plastics. Despatch PC Series Conveyor Ovens achieve superior temperature uniformity in all interior parts due to high-volume, vertical down airflow. The continuous belt design is ideal for processing large quantities of similar pieces. Pre-heating, curing, bonding, drying and heat treating are common applications in the healthcare market. HEPA filtration is available for operation at Class 1000 and better within the oven chamber. When manufacturing medical products, the stakes could not be higher. Failure to adhere to strict thermal processing steps can have a tremendous impact on people’s lives. Manufacturers trust Despatch ovens to deliver the uniform and repeatable thermal processing needed for critical components to operate flawlessly and to ensure products are free from contamination. 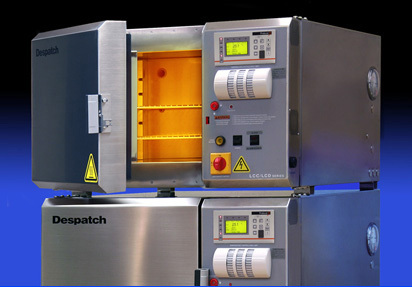 With a large installed base of units in the medical field, Despatch ovens are proven to deliver this invariable, uniform temperature for as long as the oven is in service. 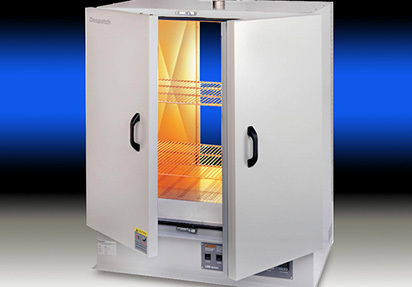 For processes where contamination is a concern, Despatch offers ovens with Class 100 HEPA filtration. The user-friendly Protocol 3 controller and Protocol Manager Software allow oven control, recipe download, and data logging and enable communication between a personal computer and up to 32 Despatch ovens. With a large installed base of units in the medical field, the performance of Despatch equipment typically exceeds process requirements for even the most exacting customer needs. Despatch understands well the many possible customer applications and can offer custom designs to accommodate many processes. For medical instrument manufacturers that need to apply polymer coatings to products such as defibrillators, pacemakers, catheters and surgical staples, a Despatch Industries forced convection oven with its tight temperature tolerances provides a superior coating drying process. By using the forced convection oven together with forced exhaust, manufacturers realize quicker cool-down times and shorter process cycles. The result is greater productivity with lower cost. 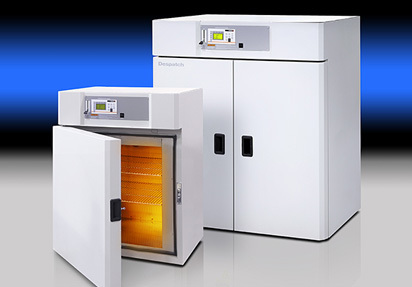 Optical labs find Despatch ovens well suited for curing optical coatings needed for scratch resistance and tinting. Ovens are available with pass-through doors for a seamless process flow through the work cell. For curing contact lenses a nitrogen atmosphere oven is used to prevent yellowing of the lenses. Despatch ovens are found in a wide variety of critical applications for the pharmaceutical industry. From R&D to production, Despatch delivers consistent, repeatable performance that adds up to shorter cycle times, higher productivity and lower operating costs. 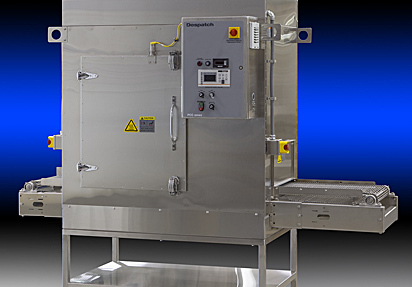 Pharmaceutical compounders use Despatch LCC cleanroom ovens to sterilize and depyrogenate implements, preparations and glassware. The recirculated air in this oven is 100% HEPA filtered for operation at ISO Class 5 (Class 100) or better within the oven chamber. The ovens can be stacked allowing independent batch processing in a small lab. These ovens can comply with USP Chapter <797> and cGMP standards. The exterior of the oven is 304 stainless steel, and the interior is type 304-2B stainless steel. All interior seams are continuously welded on the insulation side to protect the work chamber from contamination and the migration of insulation fibers.